I read the synopsis for this book and it sounded just my kind of read. Firstly it’s historical fiction (which I love), secondly it takes place just before and during the First World War (which is a special interest of mine) and thirdly it is a heartbreaking saga (which is my current favourite genre). So you can see why it appealed so much to me. I started reading and boy oh boy I absolutely loved ‘The Girl From The Mill’ but more about that in a bit. The main character in this book is a young lady called Lacey Barraclough, who works in the mill with her cousin and her brother among others. Lacey is a hard worker who stands up for what she believes in. If something isn’t right then Lacey will make sure that everybody hears about it as can be seen at the start of the book when she attracts the attention of management to the plight of the workers. Lacey is certainly somebody who gets things done. Lacey is feisty, strong determined, stubborn, compassionate, kind, gentle and the sort of supportive friend that you would love to have. Indeed by the time I got part of the way through the book I felt that Lacey was a friend. Yes I know it’s fiction but it’s real to me. Lacey has a glimmer of a love life on the horizon with Nathan, who is the son of the factory boss. It’s not going to be easy for them both though because they are from such different social backgrounds. I was literally crossing everything that things worked out for Lacey and Nathan. Do things turn out well for them? You are just going to have to read the book for yourselves to find out as I am not going to tell you. This is one of those books that grabbed my attention from the start and kept my attention all the way through. I was gripped by the story and I had to keep reading to see what fate had in store for Lacey and her family. I was so wrapped up in the story that I didn’t realise just how quickly I was getting through the book until I looked up and saw that I had read just over a third of the book. I was enjoying the storylines, the characters and the author’s writing style so much that I found it impossible to tear myself away from the book. My Kindle wasn’t exactly glued to my hand but it might as well have been because it came everywhere with me. It’s safe to say that reading ‘The Girl From The Mill’ was certainly addictive reading. I have to say that this book certainly put me through the emotional mill (pardon the pun) somewhat. I liked most of the characters so much that I felt myself going through all the same emotions that they were going through. 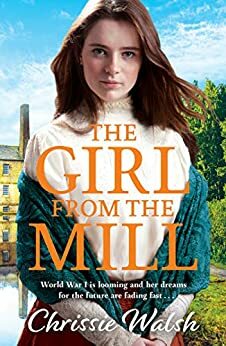 In short I absolutely and thoroughly enjoyed reading ‘The Girl From The Mill’ and I will definitely be reading any other books that Chrissie writes. I just know that they will be just as good as this one. I will certainly be recommending this book to other readers. The score on the Ginger Book Geek board is a very well deserved 5* out of 5*.